Bosch CCS-D Delegate Unit is intended for use with the Bosch CCS 900 Conference System. 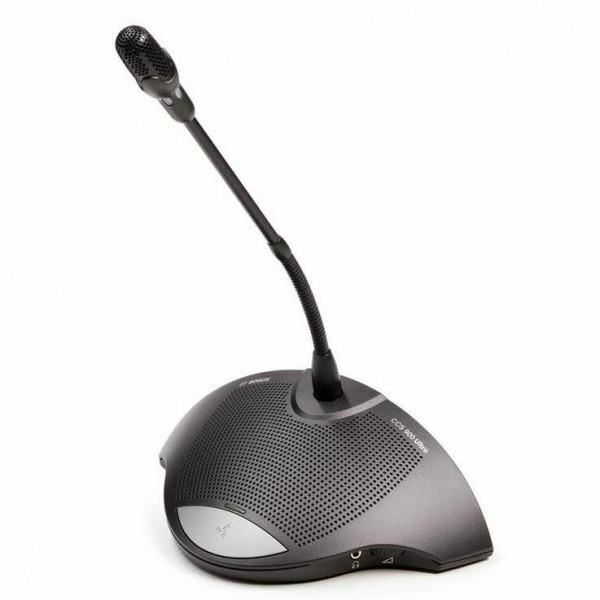 Delegate Unit features a built-in speaker and an adjustable gooseneck microphone. It's Possible-To-Speak LED illuminates to indicate when it is possible to activate the microphone. The CCS-D Delegate Unit's loudspeaker mutes automatically while in use, features a red LED ring to indicate power and a headphone output with dedicated level control. Sennheiser ew 500-945 G3 Vocal system with super-cardioid dynamic microphoneGreat technology throughout the microphone system make this system the ideal singing partner. The feedback-resistant, super-cardioid microphone capsule reproduces vocals prominently and with a smooth response. The powe..
Audiocore WH-3221U (2 Mikrofon Genggam Wireless UHF)Overview:Jangkauan frekuensi UHF yang luas: 500~900 MHz32 pilihan frekuensi untuk setiap channelKontrol mikro prosessor dan teknologi sintesis frekuensi PLLPenyaring suara dengan sistem anti-interferensi kualitas tinggiLayar LCD untuk memonitor par..